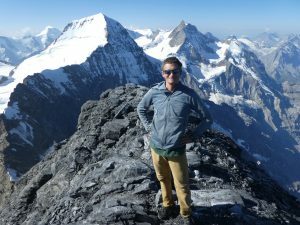 Despite falling just short of 4000m, the Eiger fully deserves its place along with Mont Blanc and the Matterhorn among the Alps’ most famous peaks. It looms 3000m in around 4000m from Grindelwald, the last 2000m comprising its fearsome, complicated north face. While the face is and forever shall be out of my league, I had hoped to honor the mountain with an aesthetic and challenging traverse. Unfortunately, it turns out that I am only good enough to go up and down the walk-off route on its west face. 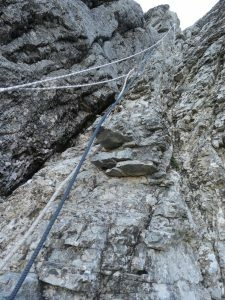 This requires about 3000m of elevation gain, but only a bit of via ferrata and a single pitch of fifth class climbing with a hand-line. The whole thing took a bit over 10 hours round-trip, including 5.5 hours hiking up, a half-hour lounging on the summit, and some time watching crazy base jumpers on the way down. After watching them plummet off the “mushroom,” and hearing the startling pop of their chutes deploying, I cannot understand how one can be both a climber and a base jumper. I had assumed that Grindelwald would be another Zermatt, but it is much more spread out and laid back. I took off from the trailhead lot by headlamp at 4:30, making a long trail traverse across the Eiger’s north face toward Kleine Scheidegg, home of the famous cog-rail and pricey hotel. As I hiked, I watched headlamps starting up from the Mitteleggi hut, and briefly glimpsed one halfway up the nordwand. 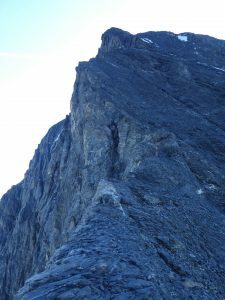 Dodging cow-pies, I eventually reached the trail’s highpoint, and branched off on a short klettersteig (via ferrata) that climbs a gully near the west end of the Eiger’s north face. Where the klettersteig turns west to climb the Rotstock, I turned right, following a switchbacking trail up scree collected at the base of the broad west face. Higher up, I followed cairns through a mixture of talus and rock bulges. The face is described online as an outward-sloping slate roof with loose shingles, and it can sometimes be that way, but for the most part I found the choss manageable, much better than the east ridge or some things I have climbed in the Canadian Rockies. The underlying rock is solid, so the only tricky part is managing transitions between bare rock and deep scree. The route is mostly class 2-3, with a single pitch of low fifth class climbing equipped with multiple fixed lines. I ignored them on the way up, and used them on the way down. Above the fixed lines, I continued following cairns to “the mushroom,” an impressive detached pillar used by base jumpers to pitch off the north face. Above, the route sees less traffic, since most people climb the Mitteleggi ridge and descend the south ridge to the Monchsjoch Hut. 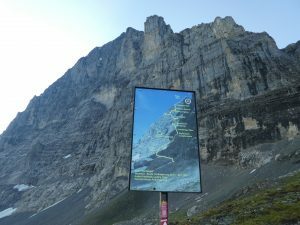 This expensive way to “climb” the Eiger starts and ends at the Eismeer station of the Eiger train, above 3000m on the peak’s southwest side, with an overnight at the Mitteleggi Hut around 3100m on the ridge. I looked into taking the train to the Jungfraujoch and tagging the Jungfrau and Monch in a day, but the ticket was over $200 round-trip. Despite not having much traffic, the route had enough cairns, a few painted rocks, and metal belay posts higher up, so it was easy to follow. Though it wanders right to get through a cliff band, it stays mostly near the ridge, with impressive views across the north face. I looked for climbers, but did not see any, despite having some idea where the Heckmair route goes. 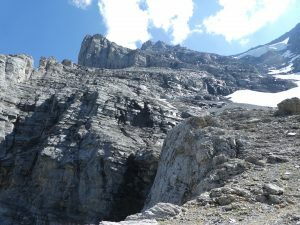 The route description I found says the climb ends on a snow ridge, which may have been true 10-15 years ago, but I ended up carrying crampons and ice axe for nothing. Frost on the rock and scree near the summit complicated things a bit, but with careful foot placement, I reached the summit just before 10:00, seeing the sun for the first time, and meeting a dozen people just arriving from the Mitteleggi Hut. It had been t-shirt weather on the climb, and I was comfortable on the summit in just my hoodie. I ate a sandwich, talked to the other climbers a bit, and admired the heart of the Bernese Alps to the south. There were the familiar Finsteraarhorn and Aletschhorn, but also new views of the Ewigschneefeld, one of the large firns that feeds the Grosser Aletsch Glacier. Fortunately everyone was descending to the south, so I did not have to worry about rockfall as I retraced my steps down the face. I had a bit of trouble following the route where it goes around the cliff band, but did not waste much time. Approaching the mushroom, I saw a half-dozen base jumpers preparing themselves on top, and a cameraman standing below. They were every bit as bro-ish as expected, fist-bumping and documenting their extreme lifestyle with helmet-mounted cameras. I watched a few of them launch, then happily descended on foot. There were a surprising number of people on the klettersteig, and hordes of hikers on the trail, threading their way through the cows. I probably should have run the trail, but I was in no hurry on my last climb in the Alps. 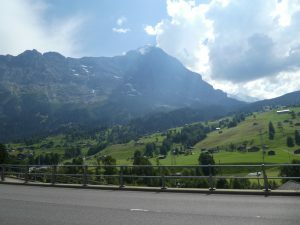 I reached the car in the mid-afternoon sun, then drove out of Switzerland through driving evening rain.